Broken mobile phone? The Gadget Lab has four little words to reassure you that it's not the end of the world. As part of my work with Wildfire HQ I am working for a fascinating, albeit anonymously-named company called FMS Group, which specialises in what's called "forensic digital investigation". FMS works with law enforcement agencies to extract evidence from mobile phone handsets that might be used in a criminal investigation. For example, engineers can examine the data on a phone and, when combined with data and call records from mobile phone network operators, they can tell you where a phone was located when a text message or phone call was made or received. Those engineers can then act as expert witnesses to give evidence in court under oath if necessary. In their video presentation (see below) you can see how the movement of a phone in a criminal case in Preston could be cross-referenced with images from traffic cameras to identify the licence number of a vehicle in which the mobile phone user was travelling. It's very clever, Big Brother stuff. Unsurprisingly, customers of FMS Group tend to be organisations such as the Crown Prosecutor, law firms, the defence industry and large corporations. But FMS has launched a new online service called Gadget Lab which is aimed squarely at you and me - which is to say, you and me when we're having a very bad day. When your mobile phone, tablet or iPod has broken and you're unable to access some vitally important contacts - or irreplaceable photos and videos - then you need someone you can trust to retrieve that important data for you. The Gadget Lab website has a friendly and approachable designed to reassure us when we're feeling desperate. The site's opening message is four very encouraging words: "All is not lost". Even if your phone is broken beyond repair, it's often possible to retrieve your data. So, if the worst happens, you can pop your phone in a padded envelope and send it off. Gadget Lab will charge you £24.99 to assess the device and if all you want to retrieve is something text-based, like messages or contacts, then that's all you'll pay. Gadget Lab offers four main services. 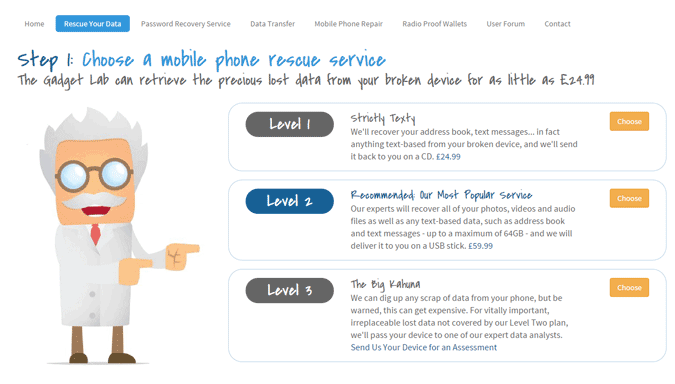 They can rescue your data, they can remove or reset forgotten passwords for about £50, they can transfer data from your old device to a new one for £45, or they can fix your mobile phone. Or some combination of the above, depending on exactly what's wrong. Mobile phone repairs are of course sometimes impossible and often less than cost-effective. In some cases, you could spend so much money getting your phone fixed that you might as well buy a new one. But Gadget Lab can fix a dodgy USB port (which will cost you somewhere in the region of £40) or broken iPhone screen (£70 or thereabouts) or get the battery charging when it's stopped taking a charge (around £30, depending on the make and model). Whatever happens, if your phone or tablet needs mending, no one can tell you how much the repair is going to cost unless they've examined it in person. One of the FMS engineers will look it over and assess the problem and give you a fair price for repair, including the best quality spare parts where necessary. And with Gadget Lab, your device gets the attention of a qualified boffin employed by a super-sleuthing forensic mobile data detective agency. How cool is that?